The chairs' elegance is furthered by many loving details like the subtly debossed logo that crests the headrest above an elliptical aluminium emblem with relief lettering which adorns the backrest. The breathable imitation leather cover is perforated in the contact zones for ideal aeration and possesses an intriguing surface texture that emulates real leather perfectly. This black-green version of the noblechairs PU imitation leather range of gaming chairs comes with green seams along with a green logo patch with golden embroidery and its easy-to-clean black artificial leather is nicely framed by black faux velour leather stripes. 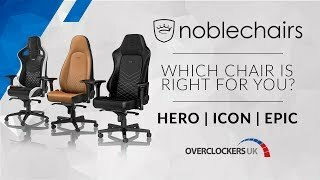 Combined with a stunning list of features the noblechairs EPIC series indubitably constitutes the pinnacle of gaming chair development. More links for "EPIC Gaming Chair - Black/Green"
I absolutely love my Noblechair, green is my favourite colour so I had to go for this model. Only issue I had was the assembly, to build this I would highly recommend to build it with a friend, installing the back can be difficult if you do it on your own. Apart from that, everything is spot on, I love the stitching and the comfort, I thought the seat was too firm to begin with but after a few weeks I can really feel the difference, I found out being firm is good rather than being soft, it is more ergonomic and better for you back. 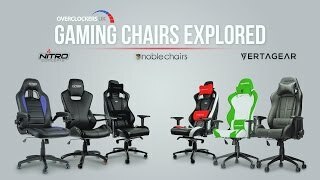 Thanks Noblechairs! Lovely quality, just a bit small. I love this chair and for a smaller person I would recommend it. However I find this chair a bit small. I am 6' 1" and the back is definitely too narrow across the shoulders and the back is just about the right height when I sit up. I find myself slouching just to get a comfortable fit. Chair itself very solid build quality, covering and stitching excellent. Padding on the seat is on the firm side but due to a textured base it is actually comfortable. Looks wise it is a pure 10 out of 10. 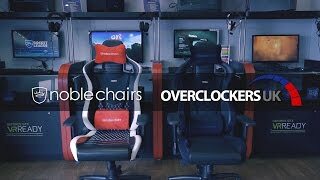 The Noblechairs Epic Series is a very well built chair that will allow you to game till your hearts content. It comes flat packed but will only take even the most novice DIYer 5-10 minutes to put together, but be advised it's surprisingly heavy as it comes with a metal base. The chair itself is pretty comfortable, it has adjustable height, arms, back and 2 cushions, one for the head and one for the back, which are really soft and supportive. Coming from a cheap, plastic office chair, the Noblechair is an absolute luxury, which I'm yet to find any faults with and I'd recommend this chair to anyone who can justify the price tag.